When we imagine Moroccan inspired interiors we think rich and lively colours teamed with warm, luxurious and unqiue styles of furnishings to make your living space inviting and welcoming. 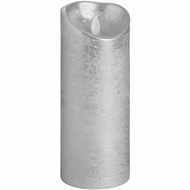 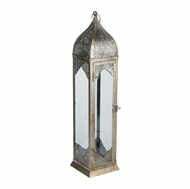 This Moroccan Inspired Silver Detailed Lantern fits in perfectly with this style, standing elegantly this is a stunning addition to interiors or exteriors alike. Built from glass and metal with intricate silver detailing and a glass shutting door, this Moroccan inspired lantern would make a unique and luxurious accessory in any home.